The American chain, the first fast-food restaurant to open in Russia, faces allegations of misrepresenting calorie counts as well as questions about antibiotics in its cheese. On the heels of the announcement that Wendy’s will be leaving the Russian market, consumers may face the loss of their favorite meals at an even more popular American fast food chain. Russian authorities are pursuing investigations into the cheese used by McDonald’s restaurants as well as allegations that the company misrepresented the nutritional information in its products. In an official statement issued July 28, Russia’s Federal Service for Veterinary and Phytosanitary Surveillance (Rosselkhoznadzor) announced that it had begun looking for antibiotics in the cheese delivered by suppliers in Germany and the Czech Republic to McDonald's restaurants in Russia. According to Rosselkhoznadzor, it could take two to three weeks to verify the presence of antibiotics in the cheese. Earlier, the office of the Federal Service for the Supervision of Consumer Rights (Rospotrebnadzor) in the Novgorod Region, about 300 miles from Moscow, said that the company’s data on the amount of proteins, fats and carbohydrates in its products, as well as the total caloric values of its burgers and milkshakes, were not factual. Moreover, the agency detected coliform bacteria in the company’s salads. The agency then suggested that several of the items be removed from the menu until the discrepancies could be resolved. "Rospotrebnadzor’s recent threats to ban sales of certain types of dishes at McDonald`s are unlikely to greatly damage the company’s reputation, as customers are aware of the company's product quality and trust it,” said Semyon Nemtsov, an analyst at investment firm Russ-Invest. Nemtsov said that in the short term, however, McDonald’s sales in Russia could decrease. The company has already seen a downturn in its position both in Russia and globally. McDonald's operates a network of 420 stores in Russia, and in 2013, the number of stores increased by 16 percent. However, during the 2008-2009 financial crisis, the company’s top competitor in Russia, Subway doubled its position in the country through franchise sales. In 2011, Subway, superseded McDonald’s in terms of the total number of restaurants. 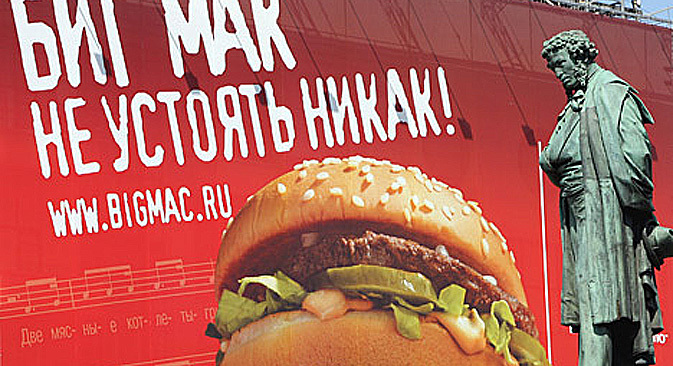 For many Russian consumers, McDonald’s is more than a fast food restaurant. Investcafe analyst Roman Grinchenko attributes McDonald’s popularity in Russia to its status as the first fast-food restaurant in the country. "An important fact to remember is that the company entered the Russian market at a time when our country was experiencing high demand for everything foreign," Grinchenko said. In 1988, McDonald's representatives began negotiations with the Moscow authorities about opening the first fast food restaurant in the Soviet Union. "The reason that McDonald’s was such a phenomenon was that it came to Russia at the right time, with reasonable prices, and in a completely untapped niche,” said Alexei Kozlov, chief analyst with investment company UFS. At dawn on Jan. 31, 1990, more than 5,000 people lined up to enter Russia’s first McDonald’s, located on Pushkin Square in central Moscow. On its first day alone, the restaurant served more than 30,000 visitors, setting a world record for customers served on a first working day in the history of the McDonald’s chain. At the time, the prices at the restaurant were quite high – a Big Mac cost 3.75 rubles – more than a monthly bus pass, which cost 3 rubles. The average salary for a Soviet citizen was 150 rubles. Until the mid-2000s, the McDonald's on Pushkin Square was considered the chain’s most popular restaurant outside the United States. Until 2013, McDonald's in Russia did not develop through franchising, but grew as its own legal entity; the company started to sell franchises only in November 2013. Market watchers say that the company was forced to do so in light of fierce competition from Subway.